This document expands upon concepts presented in the Tampa Bay Regional Strategic Freight Plan and is one of the implementation actions recommended in the Plan. 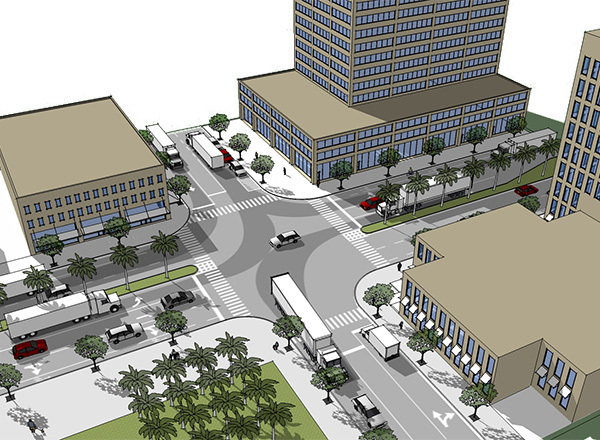 It provides ideas and suggestions to help roadway designers and transportation planners select designs that balance goods movement and livability, within the parameters established by FDOT manuals and policies. The Freight Roadway Design Considerations document is a resource for transportation planners and design engineers for considering and implementing truck-friendly design solutions in a variety of planning and design activities. The document identifies considerations for selecting appropriate design strategies relative to the function of the Regional Freight Network, the multimodal aspects of certain corridors, and the various land use contexts throughout the Tampa Bay Region. The document supplements and clarifies certain aspects of the FDOT Plans Preparation Manual and supports and expands upon modal planning and design concepts in other FDOT manuals applicable statewide. The Freight Roadway Design Considerations draft document is now available below, and can be download here. Additionally, click here to view a PDF version of a summary status presentation.